We are first introduced to Tricia, in S5 E27, when she confronts her daughter Chrissie about her pregnancy and recent marriage to Owen. Their relationship is icy at first especially when Tricia says they are alike in many ways. In S5 E28, Chrissie decides to move in with her mother. In S5 E32, Tricia comes to visit Chrissie who is in hospital with a high blood pressure. She offers to speak to Owen for her, but she declines. In S5 E34, Tricia supports Chrissie when she loses her baby. In S5 E35, Tricia takes her daughter to the funeral which is emotional for the pair. She also persuades Owen to make an appearance. In S5 E39, Tricia speaks to Owen – she feels Chrissie needs to move on with her life, and gives him baby Amanda’s possessions for the ward. However Chrissie is annoyed at her mother’s interference. In S5 E41, Chrissie is unhappy to learn Tricia is applying for a secretarial job at Holby. Meanwhile, she constantly bombards Owen, telling him to sign the divorce papers. Owen tries his hardest to convince Tricia that divorce is not the best option for her daughter as he loves her so much and doesn’t believe that there is anyone else like her. Tricia, clearly impressed by Owen’s heartfelt declaration, kisses her son-in-law. Owen responds briefly but soon pulls away saying that it’s wrong. A hurt looking Tricia leaves his office. In S5 E42, Owen learns Tricia is to be his new PA. Tricia says she can’t work with Owen when he reprimands her. She puts in a transfer but Owen doesn’t want her to go. Instead they begin kissing and go into the private office together. In S5 E45, Owen is asked by Chrissie to sign the divorce papers. Tricia snaps at Owen when she comments on him signing paperwork for the ward and whether he can still sign his name. Later, Owen goes to Tricia’s house where they kiss. Owen shows her the divorce papers which she will witness him sign. The two of them sleep together and Owen asks Tricia to turn so he can lean on her back and sign the divorce paper. Tricia does so and looks guilty at what she’s doing. In S5 E46, Owen and Tricia go to a football match together. The pair go back to her flat, however Chrissie comes home as the two of them are together. Owen has to hide on the balcony whilst Tricia comforts Chrissie on her failed marriage. In S5 E47, Tricia and Owen have an argument which raises Chrissie’s suspicions. Tricia offers to be Ric’s PA, and Owen tells her their relationship is over. In S5 E49, Chrissie remarks that her mother has been moody recently, and usually only acts like this if a man has messed her around. Tricia nervously assures her that this is not the case. Tricia tells Owen that she now realises that it was for the best they broke up. She acts very cool and detached, leaving Owen wondering if he made the right choice. Later in the shift, Owen tells her he regrets his decision, and invites her on holiday with him. She keenly accepts, and the pair are a couple once again. In S5 E51, Owen and Tricia come back from their holiday. Tricia is dropped off away from the hospital – but she is ready to tell Chrissie of their relationship. Ed discovers what the pair have been up to when he catches sight of a holiday snap of them. And with his past history with Chrissie – will he keep quiet? In S6 E2, Owen is torn between mother and daughter who both vie for his commitment. On Chrissie’s suggestion that they “take things slowly ”, he promptly bows out of going to a concert with Tricia. In S6 E3, Tricia is shocked to see Chrissie and Owen kissing passionately at work, unbeknowing they were getting back together. She is devestated which makes Chrissie question her. Chrissie asks for Tricia’s blessing, but as they talk Owen’s house keys fall out of her bag and she reluctantly has to confess all. The pair fight until they are torn apart. By next episode, Owen is unaware of the confession until Chrissie confronts him. In S6 E11, Tricia returns to complete a nurse’s refresher course and is stuck with Chrissie. Her defiant and unapologetic manner causes friction. In S6 E12, Tricia disgraces herself at Tom’s Christmas party. In S6 E14, Tricia has been transferred to the Darwin ward, having completed her training and will be working permanently with Chrissie, who’s not impressed. In S6 E19, Kath and Tricia are extremely supportive of each other throughout the day, enjoying their new-found friendship. In S6 E42, Plastic surgeon Carlos arrives to work on a private patient. Tricia nurses the patient and Carlos is impressed with her bedside manner. But when he tries to pay her for her hard work she is offended and refuses to take the money. In S6 E45, Chrissie asks Carlos to go on a second date but then decides she’s not interested after all. She tells Tricia that he is more her type and she should go for him. In S6 E46, Tricia flirts with Carlos all day but is exasperated that he has not asked her out. Just as she is about to make a move, he asks her on a date and they kiss. In S6 E47, Tricia is on cloud nine after her kiss with Carlos and the couple flirt all day. In S6 E48, Tricia complains that Carlos is taking their relationship too slowly so she brings him to the party to get him drunk and seduce him. In S6 E49, Tricia is over the moon after her night with Carlos but worries that he does not feel the same way about her. Her fears are confirmed when she tells him she’s in love with him but he does not respond. In S6 E50, Tricia is upset about the way Carlos behaved last week. He tries to talk to her but she avoids him, assuming he wants to end their relationship. After work, he tells her he has a surprise planned – he has borrowed a friend’s yacht and treats her to a Champagne lunch on deck. He says he wants a serious relationship and gives her a small jewellery box. Tricia gasps but, when she opens it, there are earrings inside and not the ring she had secretly hoped for. In S6 E52, Chrissie sees Donna flirting with Carlos and tells Tricia. Tricia confronts Carlos but he tells her he was only showing Donna some underwear he had bought for her as a surprise gift. That night, he takes Tricia back to his hotel room and they spend the night together but he makes a shocking discovery – Tricia has a lump in her breast. In S7 E1, Carlos pesters Tricia to go to the breast care clinic to get her lump looked at in the latest dose of the medical drama. Tricia eventually agrees but is shocked to find out that Diane will be doing her examination. Diane does the tests and tells Tricia that the initial result is borderline; she will find out in a week if the lump is malignant. In S7 E2, Tricia asks Diane for her test results and discovers that the lump is malignant. She needs to have it removed but refuses, as she doesn’t want any scars. However, Carlos later puts pressure on her to go ahead with the operation. In S7 E4, Carlos tells Tricia he will pay for her to get the lump removed at the Hadlington that day. She goes ahead with it and Diane and Carlos assist on the operation. But when the surgeon finds a second lump, he tells her she will need a mastectomy. In S7 E5, Chrissie thinks Tricia and Carlos are going away for the weekend but it is actually the day of Tricia’s mastectomy. 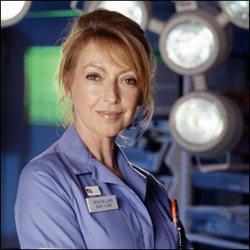 However, there is a problem during the operation and she is transferred from The Hadlington to the High Dependancy Unit at Holby. Chrissie is shocked to find out about the operation and upset that Tricia did not tell her. Tricia explains she did not want to worry her. She tells Chrissie that Carlos has been incredibly supportive but he tells Chrissie that he is leaving Tricia. A furious Chrissie slaps him across the face and then breaks the news to Tricia. In S7 E6, Tricia tells Chrissie she is coming back to work. Chrissie says she is not ready but Tricia says she cannot stop her. In S7 E7, it is Tricia’s first day in chemotherapy. She sees Carlos who apologises to her and explains that he left because he could not handle her illness, having lost his sister. Later, Carlos tells her he wants them to remain friends. In S7 E8, Tricia is tired and struggling to cope at work. Lisa tries to send her home but an angry Chrissie tells Tricia she can stay. Later, Tricia realises she needs to rest and decides to go home. In S7 E9, Tricia’s test results are good – her white blood cell count is up. However, her friend Maggie is re-admitted and it transpires that she has secondary cancer of the lung. Tricia is devastated and breaks the rules by telling her the results before Connie does. In S7 E10, Maggie’s condition worsens and is operated on. The prognosis is bad and they tell her she only has weeks left to live. Tricia asks for time off to nurse her. She then tells Maggie she will be coming round with Chrissie for lunch on Christmas Day. In S7 E14, Tricia brings Maggie into Holby in an ambulance. Connie tells Maggie that the scans show the cancer has spread. Maggie begs Tricia to take her home to die but Tricia says she is too ill and begs her to take the drugs on offer at which point Maggie dies. Connie refuses to bring her back to life as Tricia begs her. Connie relents and as Chrissie and Tricia help, they all bring Maggie back to life. Maggie begs Tricia to take her home to die but Tricia cannot, however, Tricia does agree to take her outside. Connie catches them and Tricia thinks she is going to berate them, but she gives them a bottle of champagne and watches on sadly. Tricia says an emotional goodbye to Maggie who is unconscious as Chrissie has given her morphine. Maggie opens her eyes looks at Tricia and dies. In S7 E15, Tricia goes to see Maggie’s body. Afterwards, as she passes her empty bed she breaks down. Chrissie sees and tells her to go home – Tricia refuses. Later, Tricia reveals that she feels guilty about bringing Maggie into the hospital when she wanted to die at home. At the end of her shift Tricia opens up to Chrissie. She says that she feels old and lonely. She mourns her failed marriage and says she wishes things had turned out differently. In S7 E19, Tricia’s ex-husband [ID 1443]Mark[/ID] comes to Holby having been tracked down by Chrissie the previous episode. When Tricia bumps into him, she is furious at seeing him. Tricia warns Chrissie if she wants a relationship with her father, she has to choose between them. In S7 E20, Connie lets Mark work a shift as they are short staffed not pleased Tricia. In S7 E21, Mark decides to leave Holby as it is obvious that Tricia does not want him around, and Chrissie is coming round to her mum’s way of thinking. After dealing with a patient whose parental situation mirrors her own, Tricia changes her mind and tells Mark he can stay – Chrissie can make up her own mind. In S7 E22, Tricia is annoyed to learn she is working with Mark. Chrissie warns her to behave professionally towards him but the pair bicker throughout the day. At the stag do Mark and Tricia talk and make-up, Tricia makes him promise not to hurt Chrissie. In S7 E23, Diane tells Tricia that she had a ‘moment’ with Ric last night – Tricia promises to keep it secret. Chrissie tells Tricia that she slept with Owen and that she still loves him. She warns that she will not let the wedding go ahead. Tricia convinces her that Owen has to make that decision – not Chrissie. Tricia and Mark talk at the reception and decide to call a truce. In S7 E24, Mark tells Chrissie that he wants to ask Tricia out, she questions whether this is a good idea. In S7 E29, Chrissie is still annoyed with Mark, but he cannot understand why she is so upset with him. She tells Tricia that she wishes they had not been re-united. Later, Mark tries to talk to Chrissie but she is not interested. She decides to go for drinks with Tricia that night to catch up. In S7 E35, Tricia is shocked to see Carlos and has to treat a burns patient with him. Carlos tries to tell Tricia he is pleased she has got the all clear but Tricia is not interested. Chrissie warns Carlos to stay away from Tricia – he has caused her enough hurt. Carlos sees Mark and Tricia together and assumes that Mark is her new boyfriend. Carlos apologises to Tricia for his behaviour and asks her if she would like to have reconstructive surgery on her breast. Tricia is furious and tells him she wants nothing from him. Mark speaks to Carlos and tells him he put Tricia through hell. Carlos realises that Mark is Tricia’s ex and reminds him that he walked out on her. The two men argue and Chrissie is forced to prise them apart. Outside, Tricia and Carlos speak. Tricia says that she loved Carlos so much that when he left she had almost wished the cancer would finish her off. Carlos confesses that he asked for his patient to be treated at Holby so he could see her again. He begs to make amends and says he will do the reconstructive surgery for her, Tricia walks off in tears. Later, Tricia tells Carlos that she will go ahead with the surgery but that she wants to pay for it – she does not to feel she owes him anything. In S7 E36, Tricia gets prepared for her reconstructive surgery but is upset to learn the operation has been cancelled indefinitly. Carlos offers her surgery at the Hadlington. She is unsure of taken up his offer, but Mark persuades her. As Tricia is on the operating table Carlos tells Tricia he loves her, just then Mark arrives with a bunch of flowers, unaware he has spoilt Carlos’s moment. After the operation Mark waits to see Tricia but Carlos convinces him to go home. Back at work Chrissie is surprised to see Mark and tells him he should fight for Tricia, Mark realises she is right. When she wakes up Carlos tells Tricia he wants her back, but she worries that if the cancer came back he would leave her again but he begs for another chance. In S7 E39, Elsewhere, Tricia is having her bandages removed after her reconstructive surgery. She has an infection and will need an operation. Carlos asks Tricia to come to Miami with him for two weeks to rest but Tricia is unsure. He tells her how much he loves her but she says it’s not enough and she won’t take him back. Tricia tries to hand him a cheque, but he refuses to accept it. After the operation, which is successful, Mark also goes to see Tricia. She breaks down and he comforts her. The pair look close again. In S7 E42, Tricia helps Mark out of a jam when she finds out he is homeless by offering him the spare room at her place. In S7 E43,it is Mark’s birthday and, as a surprise, Chrissie decides to secretly track down his father, Frank – the pair haven’t spoken since Mark’s mother’s funeral. At the party, Tricia and Mark are about to kiss when Chrissie walks in with Frank. Tricia and Frank are horrified to see each other. In S7 E44, Tricia says she loves Mark but fears Frank will ruin everything. Meanwhile, Frank drives Chrissie into work but then collapses in the car park. She takes him upstairs where Connie discovers he has an aneurism and needs an emergency operation. The operation isn’t a complete success and his condition remains serious. Despite Frank’s illness, the family feud continues to rage and an upset Frank finally lets a secret slip to Lisa – that he is Chrissie’s father. Lisa is unsure what to make of the revelation but puts it down to him being confused. In S7 E45, Lisa informs Tricia of Frank’s revelation in the night but Tricia laughs it off. Later Lisa finds Tricia crying and she admits to her that Frank raped her years ago. Meanwhile Frank is determined to tell Chrissie the truth, but Tricia manages to hold him off for a while by demanding a paternity test before he says anything. However Frank’s condition worsens and Tricia is asked to approach him about his wishes on resuscitation, as Mark and Chrissie are both too overwhelmed. As she argues with Frank about the past, he loses consciousness. Tricia lies, saying that he did not want to be resuscitated, and Frank dies. Chrissie is upset over Frank’s death and is upset with Tricia, little does she know that Tricia has just doctered his forms with ‘DNR’. In S7 E46, Tricia is struggling with keeping her dark secret and tells Lisa she no longer wants the paternity test as she wants the matter buried with Frank. We see a conversation between Tricia and the ghost of Frank, and one of Frank’s old friends makes it clear to Tricia he knows the truth but says he will keep it to himself. Frank’s funeral, in the afternoon, fails to bring the Williams family closer together and Mark storms off, losing his temper with Tricia when she pulls faces during a reading and when she later tells him ‘I hope he rots!’. In S7 E47, Chrissie and Mark are both giving Tricia the cold shoulder after recent events – Mark returns her house keys and any chance at rekindling their romance is over. Lisa tells Tricia it was too late to cancel the paternity test results. Lisa persuades her to find out the truth. Tricia opens the results and pretends to Lisa that everything is fine and Mark is Chrissie’s dad, but when Lisa leaves the room – Tricia’s face turns to horror as we are shown that it is Frank who is infact the real father. In S7 E48, elsewhere, Tricia’s mind is not on the job and she makes some clumsy mistakes. When she breaks down and confesses her secret to Diane, Diane says she must tell Mark and Chrissie. In S8 E14, the net is closing in on Tricia, who has trouble hiding the truth from Mark, and Frank’s life insurance company ask Mark to see his medical notes.